O'Faolains Boy had to dig deep to record a neck victory from the gallant Smad Place in the RSA Chase at Cheltenham this afternoon. The 12/1 shot was never travelling in the early part of the race for jockey Barry Geraghty but he got his act together in the latter stages and looked full of running as the field turned for home. The seven-year-old looked like he was going to win with something in hand jumping the last but the runner-up never gave in and the two got into a protracted dual on the run-in, with O'Faolains Boy just getting the better of his rival as they crossed the line. Geraghty, who was riding his 30th Festival winner, was pleased with the winner even though he had a tough ride in the early stages of the race. He now moves into second place behind Ruby Walsh in terms of number of winners ridden at The Festival. "If you'd have asked me where I was going to finish during the first half of the race, I'd have said I was going to pull up," admitted Geraghty. "He ran in snatches a little bit. He didn't jump as well as he did at Ascot and I was never happy. I never thought that I would win but I suppose that he just started coming alive over the last mile. He got there slightly under sufferance but I knew I had a little bit in hand. "I say that he didn't improve on his Ascot run. There's improvement in him - he didn't feel as good as he did as Ascot. He struggled a little bit but I wouldn't say it was because of the ground or anything but he didn't sparkle for some reason. He still won anyway. "It's difficult to say how he'll go on from this. It wasn't his true form and because of that, you'd have to say he's going to be better than this." O'Faolains Boy's victory was a dream come true for the four-man syndicate that own him. Part-owner Tony Outhart was visibly delighted and paid tribute to the winning jockey. "That was fantastic - we all can't believe it," said Outhart. "Barry (Geraghty) has given him an amazing ride considering he wasn't happy during the early part of the race. We knew he was a good horse but to win here is a dream come true. "We've got a few horses in training at the moment and have had some success here in the past but we've not had a winner at Cheltenham for six years so we've had to wait awhile!" Rebecca Curtis trained her third Festival winner - one each in consecutive years- when O'Faolains Boy landed the RSA Chase. Her two previous winners run in the next two days, with At Fishers Cross tackling the Ladbrokes World Hurdle and Teaforthree running in the Betfred Gold Cup. Curtis, from Pembrokeshire in West Wales, said: "We've always thought a lot of him, and even last season were thinking of him as an RSA Chase horse and thankfully he has turned out to be one. He's handled this better ground and won nicely. "It's amazing to get another winner at the Cheltenham Festival. It's brilliant. Before Christmas, the horses weren't running great but hopefully they have all peaked at the right time now and we knew he was very, very well coming here. We were quite hopeful. It was a very, very good race but we have always thought a lot of this horse. "He's only ever run one bad race when all our horses were running poorly and he scoped badly so we were hopeful of a good performance today. When he ran badly at Haydock Barry was quick to pull him up so there was no damage done. I was impressed with his win at Ascot and he improved at home after that. It would be a dream if he turned out to be a Gold Cup horse. Of At Fisher's Cross, Curtis said: "Everyone thinks of him as a horse who needs mud, but the way he jumped and travelled at Aintree last year tells me he won't have any problem with better ground. "He's as good as he's ever been so we are hoping for a good run." The Alan King-trained Smad Place lost out by a neck in a great finish. "I'd have love to have won but ours ran a blinder and I've no excuses, we were beaten by a better one," said King. "We always thought he'd be as good a chaser as hurdler and he proves he has. 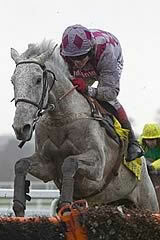 "Choc's gutted - of course you want to ride a winner - but Smad Place was beaten by a better horse. I am thrilled with him. "The ground drying out was not a problem for him. I would have loved to have won but he has run well." Pat Fahy, trainer of third-placed Morning Assembly who was six lengths back, added: "It was a good run but it was a rough race. We got into a bit of bother and I'm delighted with how he ran in the circumstances. It was only his heart and the fact that he stayed so well that got him to finish where he did. "It was only his third run over fences and the ground has quickened up, which made a big difference. Davy (Russell) said he'd never ridden in such a quick RSA Chase. We'll go to Punchestown next."